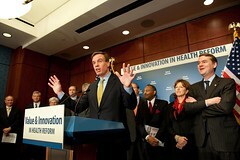 On December 8, Senator Warner and 10 other Freshman Senators introduced the "Value and Innovation" amendment package, aimed at encouraging innovation and affordability for consumers across the U.S. health care system. The legislation has been introduced by: Sens. Mark Begich (AK), Michael Bennet (CO), Roland Burris (IL), Kay Hagan (NC), Ted Kaufman (DE), Paul Kirk (MA), Jeff Merkley (OR), Jeanne Shaheen (NH), Mark Udall (NM), Tom Udall (CO) and Mark Warner (VA). Supporters of the package include: AARP; Business Roundtable; Safeway; New America Foundation; AFL-CIO; National Partnership for Women and Families; CEO Workgroup for Health Reform; Center for American Progress; Healthcare Leadership Council; National Association of Manufacturers; Walmart; Target; Catholic Healthcare West; Virginia Hospital and Healthcare Association; Carilion Clinic; David Cutler (Harvard Economist); Consumers Union; Small Business Majority; Kelly Services International; Intel; US PIRG; Better Health Care Together; Brookings; Pacific Business Group on Health; Quadgraphics; Health CEOs for Health Reform; Corporate Health Care Coalition; California Public Employees’ Retirement System; Denver Health; Virginia Mason; Billings Clinic; University of Wisconsin Hospitals; Group Health Cooperative; Main Street Alliance; Ascension; Physician Health Partners; Health Grades; Gunderson; HR Policy Association; and National Community Pharmacists Association. Sec. 3601. Quality Reporting for Psychiatric Hospitals. The section would create a pay-for-reporting program for Medicare inpatient psychiatric hospitals beginning 2014. A percentage of payment for these facilities would be tied to successful reporting of quality data, which would be available to the public after opportunity for a hospital or unit to review their performance. Sec. 3602. Pilot Testing Pay-for-Performance Program for Certain Medicare Providers.This section would direct the Secretary to begin pilot testing of value-based purchasing (pay-for-performance) programs for certain types of Medicare providers no later than January 1, 2016. These provider types include: inpatient psychiatric hospitals, long-term care hospitals, inpatient rehab facilities, acute prospective payment system-exempt cancer hospitals, and hospices. The Secretary would have authority, after 2018, to expand these pilots if the CMS Chief Actuary determines it would reduce Medicare program spending while maintaining or improving the quality of care. Sec. 3603. Plans for a Value-Based Purchasing Program for Ambulatory Surgical Centers.This section would direct the Secretary to develop a plan to create a value-based purchasing program for ambulatory surgical centers. The plan would be submitted to Congress no later than January 1, 2011. Sec. 3604. Revisions to National Pilot Program on Payment Bundling. This section would modify the new CMS pilot on Medicare bundled payments created by the Patient Protection and Affordable Care Act. It would expand the number of health conditions tested under the pilot and give the Secretary authority to expand the duration or scope of the pilot after January 1, 2016 if the CMS Chief Actuary determines it would reduce Medicare program spending while maintaining or improving the quality of care. Sec. 3605. Improvements to the Medicare Shared Savings Program.This section would give the Secretary greater flexibility in administering the Medicare Shared Savings Program. This program is created by the Patient Protection and Affordable Care Act to reward Accountable Care Organizations (ACO) that successfully coordinate care to lower costs and improve the quality of care. Sec. 3606. Incentives to Implement Activities to Reduce Disparities. This section would ensure that qualified health plans offered through new American Health Benefit Exchanges include programs to reduce health disparities as part of required quality improvement activities. Sec. 3607. National Diabetes Prevention Program.This section would direct the Centers for Disease Control and Prevention (CDC) to establish a national diabetes prevention program that targets individuals at high risk of developing diabetes. It authorizes federal grants to entities developing community-based diabetes prevention models and other training and outreach activities. Sec. 3608. Selection of Efficiency Measures. This section would ensure that measures of efficiency are included under new quality measure development activities supported by this Act. Sec. 3609. Regional Testing of Payment and Service Delivery Models Under the Center for Medicare and Medicaid Innovation. This section would gives the new Center for Medicare and Medicaid Innovation (CMI) established under this Act explicit authority to target the testing of new payment and delivery models to more regions. Sec. 3610. Additional Improvements Under the Center for Medicare and Medicaid Innovation. This section gives CMI additional flexibility in selecting models to be tested and permits the Secretary to give preference to models that would align Medicare and Medicaid spending with other public sector or private sector payer quality improvement efforts. Sec. 3611. Improvements to the Physician Quality Reporting System.This section would modify the current Medicare Physician Quality Reporting Initiative (PQRI) to permit physicians who report quality data through a qualifying Maintenance of Certification (MOC) program to be eligible for an incentive payment for years 2011-2014. The Secretary also is permitted, starting in 2014, to include MOC participation as a component of the PQRI composite measure. Sec. 3612. Improvement in Part D Medication Therapy Management (MTM Programs).This section would require Medicare Part D prescription drug plans (PDPs) to offer a minimum set of medication therapy management services to certain targeted beneficiaries. It also would require PDPs to routinely assess at-risk individuals who are not enrolled in MTM services and automatically enroll them (permitting beneficiaries to opt-out if they choose). Sec. 3613. Evaluation of Telehealth Under the Center for Medicare and Medicaid Innovation.This section would permit CMI to evaluate, analyze and make recommendations about the effectiveness of telehealth behavioral health issues (such as post-traumatic stress disorder) and telestroke services in medically underserved areas and Indian Health Service facilities. Sec. 3614. Revisions to the Extension for the Rural Community Hospital Demonstration Program. This section would extend the Rural Community Hospital Demonstration Program for an additional five years, instead of one year as originally proposed by this Act. It would expand the number of hospitals eligible for the project from 15 to 30 and make 20 rural states eligible to participate, instead of the current 10. Another provision allows already participating hospitals to rebase Medicare reimbursements according to current health delivery costs. Sec. 3621. Developing Methodology to Assess Health Plan Value.This section would require the Secretary to consult with relevant stakeholders to develop a methodology for measuring health plan value, which would include the cost, quality of care, efficiency, actuarial value of plans. The Secretary would submit a report to Congress concerning the proposed methodology within 18 months of enactment of this Act. Sec. 3622. Data Collection; Public Reporting.This section would modify the new data collection and reporting efforts created by this Act by requiring the Secretary to establish and implement an overall strategic framework for the public reporting of provider performance on reported quality measures. Sec. 3623. Modernizing Computer and Data Systems of the Centers for Medicare and Medicaid Services to Support Improvements in Care Delivery. This section would require the Secretary to develop a plan, within 9 months of enactment of this Act, to modernize the Centers for Medicare and Medicaid Services (CMS) computer and data systems. Sec. 3624. Expansion of the Scope of the Independent Medicare Advisory Board.This section would require the Independent Medicare Advisory Board (IMAB) created under this Act to produce an annual report starting in 2014 that includes national and regional information on the cost, utilization, quality, and other features of health care paid for by private payers and Medicare. IMAB also would be required to take the findings of these annual reports into account when preparing proposals to improve Medicare. IMAB also would, starting in 2015 and at least every two years after, submit recommendations to Congress and others on how to slow the growth in national health expenditures. Sec. 3625. Additional Priority for the National Health Care Workforce Commission.This section would require the National Health Care Workforce Commission created under this Act to also make recommendations to remove the barriers that health providers encounter to beginning or maintaining professional practice in primary care. Sec. 3631. Health Care Fraud Enforcement.This section increases federal sentencing guidelines for all federal health care offenses that involve a loss greater than $1,000,000. This section amends the definition of “health care fraud offense” to include health care crimes that are codified outside of Title 18. This section clarifies the definition of “willfully” to prevent defendants from escaping punishment for violation of a federal health care fraud offense by arguing that they were not aware of the specific criminal provision that they are accused of violating. This section also provides that obstruction of criminal investigations involving administrative subpoenas under the Health Insurance Portability and Accountability Act (HIPAA) of 1996 is treated in the same manner as obstruction of criminal investigations involving grand jury subpoenas. Finally, this section permits the Department of Justice to issue subpoenas in investigations pursuant to the Civil Rights of Institutionalized Persons Act. Sec. 3632. Development of Standards for Health Care Financial and Administrative Transactions.This section would require the Secretary, beginning no later than January 1, 2012, and every three years thereafter, to convene stakeholders to identify opportunities to create uniform standards for financial and administrative health care transactions, not already named under HIPAA, that would improve the operation of the health system and decrease administrative costs. Initially, this would include areas such as health claim edits, provider enrollment, and audits. Once the panel identifies new health care transactions that should be made uniform, the Secretary can develop standards for them. Health plans will need to comply with these new standards and associated business rules or face a financial penalty. In addition, this section convenes health information technology stakeholders to ensure a smooth transition takes place for providers as they move from one coding software to the next.